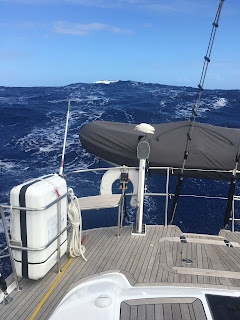 When we spoke to the other boats at 1500 everyone else had sun but we were still in the grey cloud, however then the squall clouds cleared and it was beautiful, but still pretty windy with seas up to 3 metres rolling down onto us - cobalt blue and mesmerising…. Over night we did not have any squalls but a clear sky, however the wind went around to the East. This meant we went a little north as we had the sails set for North East, we decided to run with it rather than make changes in the dark. We had 20-25 knots all night so made good speed with our very reefed main, even if it wasn't completely on the right course. At first light we gybed the main and re-ran the preventer lines. 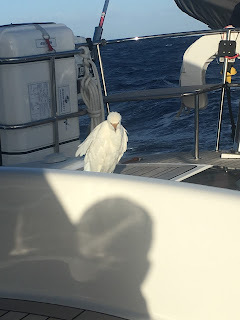 I went on the foredeck and it was pretty exhilarating; I also found our first flying fish on deck. We are now running with both sails on the starboard side at 120 degrees making a little more south; which we will do most of the day - this is so if the sea increases we can run directly down wind /waves towards Barbados. The bird, now named Kath (Aussies think Kath n Kim), is still with us and Andrew is now having conversations with her and putting her on watch. 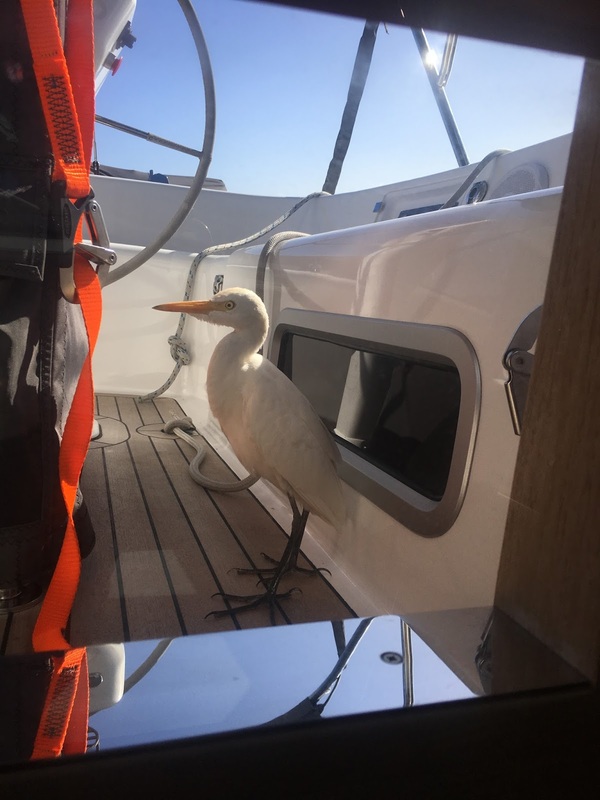 They have bonded so much that she doesn't fly off when he goes in the cockpit, he was just in the shower and she was peering in the bathroom window now he's in the saloon and she is looking through the deck saloon window - seriously?? Maybe we can challenge the guy sailing around the world with a chicken?? During the night we have been running the radar to watch for squalls, at 0500 I noticed a small blip about 5 miles ahead that looked like a boat, could it possibly be? In this huge ocean it's hard to believe you could come across a yacht but it was, no AIS but a clear radar target that we tracked and then passed by at a distance of 3 miles. Then they called us this morning on the VHF as they had an AIS receiver so could see us - German Yacht Lady Sunshine. Andrew conveyed our latest weather reports and had a nice chat; they're also heading to Barbados. All is well and we are really rested, despite the seas. We have been using a lot more power in the last few days as we are running radar all night and the autopilot is working harder due to this sail configuration. We have increased our generator time from one hour a day to two, which is keeping up. We are generally running the water maker for about one hour a day to keep the tank full, while having long hot showers everyday. We still have over 650L of diesel and only dipped into the freezer for the first time today - Moroccan Lamb Casserole for dinner tonight. Great to read your progress reports. Flying home on Sunday- place won't feel the same without you!